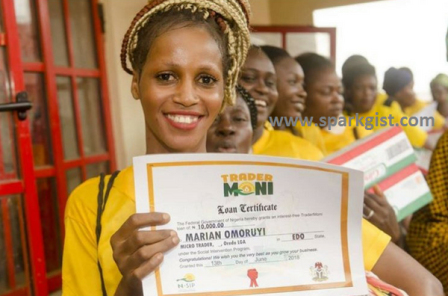 The Trader Moni is designed to help petty traders expand their trade through the provision of collateral free loans of N10,000. The Trader Moni was launched last Tuesday in five markets in Lagos State recording thousands of beneficiaries already. Trader Moni was launched in partnership with the Bank of Industry (BoI) in order to enlarge government’s “financial inclusion agenda down to the grassroots, the bottom of the ladder, considering the contribution of petty traders to economic development. Go to our website: www.boi.ng. I’m so interested in this loan and I’m a dealer of eyes glasses at wuse market Abuja. Is the trader MONI Programme closed in Kano? Is the application accessible online? If yes, how can I apply? Specify the address that will take me direct to the trader moni application platform please. Thank you. Thanks for this practical guide. I got SMS but the code I was told to dial is not going what is the next step pls? Federal Government don approve your 10,000 Naira TraderMoni LOAN. Dem go soon send Eyowo alert enter you phone. Follow the instruction well well. REMEMBER: This loan fit reach N100,000. Pay back this first N10,000 in 3 to 6 months, dial again collect N15,000; after, that, na N20,000; then N50,000; then N100,000! I tried using the method to transfer the money into my account but the system keeps failing, and till now I haven’t get the fund. The question now is, how can I get this fund? This also applicable to the group of people we registered together at the same point of time. For those of you are are complaining of getting the funds after getting the confirmation message. go back to the agent who did the registration for you, he is the one to provide the money to you. Good evening, pls kindly help me on how to become trader moni agent in Osun State. I tried applying for this program with no luck. I could not get my 10000. How will I do? I transfered the money to my bank account and I did not get pin, no alert. If I checked my mobile money balanced they said my balance is zero. Pls help me! My name is Abdulsalam ibrahim from zamfara state, I’m the that write their no capture, please how will you. The second problem the people that removed the money on their accounts but the money that not come in the main account while. Please When start pay the for borno state? I have my business plan with o,I,c in entrepreneur ships development in poultry farm since 2011 with my certificate of attended. My name is Mustapha Mayeloye Khadijat I apply for the trader mini since September I have not see anything, they asked us to come on 18/ 10/ 2018 for the moni on reaching there after attending to few people only to tell us that some people have collected another person moni , and tell to come another time, please help us retrieve our moni .May God help you Amin. @Mustapha, which state are you from? The money was reversed to u. D destination is diamond beta account. So many people are yet to received the 10,000 naira Trade Moni, are they going to receive or no pls. Hello i’m umar adam i applied for a trader moni since two month ago but not yet recieve my alert please help me with the number i dial to make it succesful? Look out for any agent around you. Please I registered for trader money but I’ve forgotten the pin I used when I registered it. I just got a message but I was asked to reset my pin please how do I go about it? I have submitted my form what can I do thank you. I registered but the number I used has been damage and I had another number how can I see my own code? Can I put my alternative number to receive the message? Please must I be a member of market association what me that am selling in a shop in front of my house and not in general market how can I apply. Pls what takes u so long trader moni? here in zamfara we have not recieved ur response…..! Pls do same thing here. When will it be for Ogun state people to have access to the loan. I registered, upto naw i did’nt recieve any text, what should i do? Pls how can I register. Please I registered but up to now I didn’t receive any text,please what should I do? How can I register as an agent on the trader Moni scheme?